Cook like a local in a Hawaiiana style home! A unique three hour cooking and dining experience in the majestic Diamond Head area. 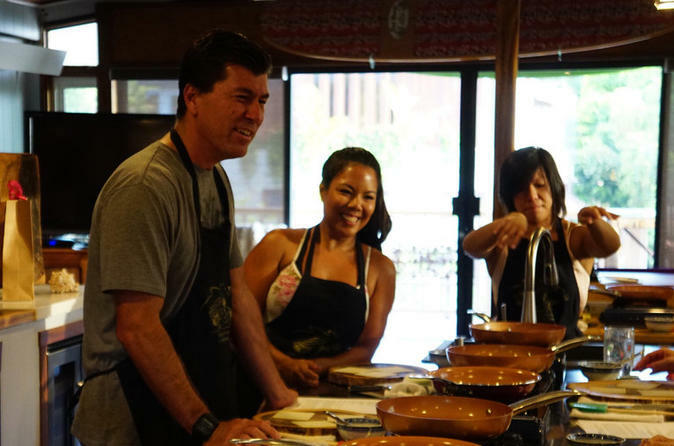 We will prepare and cook a menu of Hawaii favorites, giving you a full hands-on local experience. After the class, you'll enjoy your freshly prepared meal at a communal table with other cooking guests and enjoy a glass of wine, beer, or other beverage of choice. A unique cooking and dining experience in the majestic Diamond Head area. We welcome all skill levels, from the curious beginner cooks to advanced home chefs. We will prepare and cook your menu and recipes with a full hands-on local experience. Afterwards, you will enjoy your freshly prepared meal at a communal table with your other cooking guests with a complimentary glass of wine, beer or other beverage of choice. Our best-seller, the Hawaii Local Favorites class, includes menu items such as a trio of Island Fresh Poke, North Shore Kahuku Coconut Shrimp, Deluxe Musubis and our chef's famous Butter Mochi! Contact us directly before booking for alternate cuisines and class types. Private, group and custom classes available.